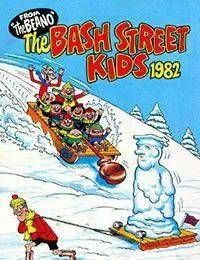 The Bash Street Kids Annual was a book published from 1979 to 2010 to tie-in with the childrens comic The Beano, specifically The Bash Street Kids comic strip. There were 26 editions in total. The annuals featured about 15-20 individual reprints from the previous 7 to 12 years of The Bash Street Kids strips from its parent comic, supplemented by some new material. Originally a new annual was published every two years. However, after the 1986 annual was published in 1985, it was decided to make the annual a yearly publication instead. From 1988 until 2010 a new annual was published every 12 months without a break.